Practical and versatile, our 3-ply Stainless Steel Saucepans with Lid are perfect for everyday use from cooking vegetables, rice or pasta to fresh sauces and soups. The close-fitting lid helps to retain moisture and flavour, while the secure stainless steel handles ensures the pans are easy to lift even when full. 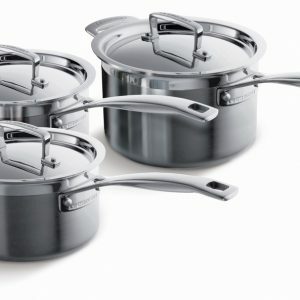 A true kitchen essential, the 3 Piece Saucepan Set contains a 16cm Saucepan, 18cm Saucepan and 20cm Saucepan – all with lids and helper handles. 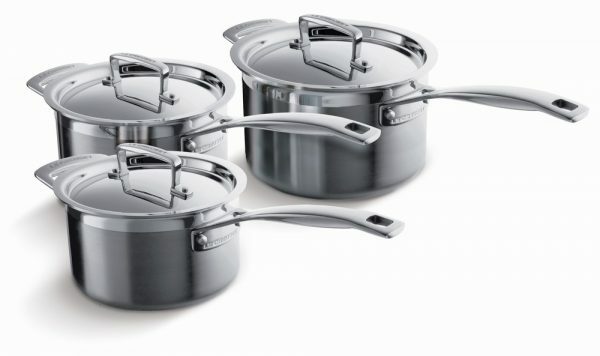 Stylish design and superb cooking results are at the heart of our 3-ply Stainless Steel cookware. Using the latest multi-layering technology, where premium-grade stainless steel and aluminium are bonded together to form a special 3-layer material, heat spreads evenly and gently throughout the entire pan from base to rim. Helpful design features, such as capacity markings, helper handles and an all-round pouring rim to prevent drips, means cooking with our 3-ply Stainless Steel cookware is easy and enjoyable. The range is suitable for use on all heat sources, including induction, is oven and dishwasher safe* and comes with a reassuring lifetime guarantee.